He is my sister’s son, and a really great, smart, athletic kid. He and my son are 5 months apart, and we live in the same town, so they go to the same school (1 grade apart) and have been on several sports teams together. My nephew was diagnosed with a potentially fatal adrenal gland problem when he was a baby, and he had to take steroids, specifically cortisol, quite often, since his body didn’t produce any itself. He has since sort of outgrown the dangers of that condition, and it is no longer a threat. But in the past months, he has been suffering increasing hip pain on one side. They have taken him to doctors and gotten several opinions. He definitely has something called Avascular Necrosis, where the hip bone has died in spots, due to lack of blood flow at some point. It turns out that about 20% of cases are caused by steroid use. At first, they thought he was over the worst of it. He wore crutches for a few weeks, and they thought that should help him heal. Kids are able to regrow the bone, if pressure is relieved. But on subsequent visits, it turned out that his condition was quickly deteriorating. His doctors did minor surgery this week, cutting his ligament, so that he could have more range of motion. Then he was fitted with this abduction brace, which will keep his hips at the right angle for the bone to regrow. He will have to wear this brace for at least a year, maybe 18 months. It keeps his hips and legs at that angle, to relieve the pressure on his femur. Hopefully, this will help the bone regrow fully. The heartbreaking thing is that this is a kid who is very active in three sports, and he will have to give up all of them. On top of it, this contraption is so darned conspicuous, and his gait is beyond ungainly. He has to move side to side and forward at the same time, clicking and creaking with each step and taking up about twice as much room as he used to. I do know that he is lucky to still be able to walk at all and to not be dying. Really, I do, but this is going to be really hard on him. His dad is trying to figure out the simple things like how he is going to walk to and from class each day. It will be harder next year when he is in middle school and has to change classes. Not to mention the social pressure of having to go through this right when he is entering junior high. His two “best friends” pulled his pants down at school a couple of weeks ago when he was on crutches, since he couldn’t use his hands to help himself. He has always been an athletic, outgoing kid, but he was already having a hard time this year, and they seem to have been kicking him while he was down. I know he will get through this, but I hope it doesn’t cause him to change his personality too much. Monday is the big day when he will have to go back to school, so please keep him in your prayers. Thanks! ~ by bekaboo on February 20, 2009. BTW, can you send me your Ebay link. I have your Etsy, but I want to bookmark your Ebay one as well. 🙂 Thanks! Oh, I’m so sorry to hear about his tough time (some friends, I must add). 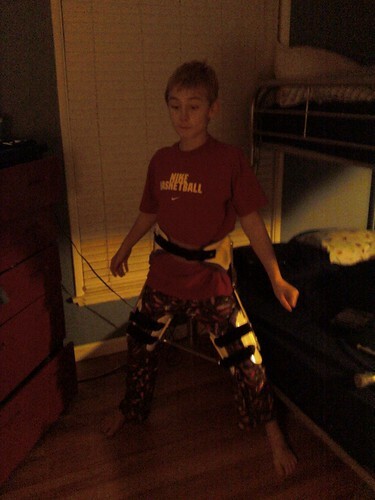 My son had to wear an abduction brace for his hips some years ago (to help counteract the effects of involuntary posturing he was suffering at the time). They looked just like that. I feel for him–I really do! sending lots of positive thoughts his way. Fortunately school administration is more aware of bullying then they were when we were in school. Hopefully that’ll help his transition. I am so sorry to hear this, Beka. It’s difficult enough for a boy his age to have something like this happen to him, but to be teased/bullied as well … that’s just awful! Beka, I will for sure keep him and his family in our prayers. As a parent it is harder to see your child suffer than if you were to suffer yourself. I cannot imagine how hard it is going to be on a active young boy. It will surely be a test of his patience. Honesty, I think if it were my child I would home school him next year to avoid all the issues. No matter how thankful they are that he is still alive, and can be treated, it is hard for a little boy to face such a challenge. My thoughts go out to your family. Hang in there! Oh, crap that’s rough. Tell him he can always swing one of those heavy braced legs into the rotten little b*stards and do some real damage. Hehehe. Would an adult ever put up with the crap kids have to? I am so sorry to hear that. I will definitely say some prayers for him. What a difficult situation – why do kids have to be so horrible to each other sometimes? keep your chin up. my son has legg/calve perthes disease and he is going throw the same exact thing. he is 7 years old. it is really hard but things will get better.GOOD LUCK! my prayers are with you. Thank you, Rebecca. It is worse in older kids for some reason, but they do have some hope from a surgeon in Baltimore, who does a very successful surgery. Right now we have a much more scary situation going on with his little brother, so unfortunately Seth’s situation is on hold. He is mostly in a wheelchair right now, since his bone did deteriorate greatly, but there is new hope. Thanks again. I am glad your son is doing well!